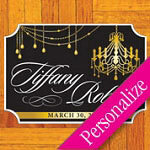 Get your guests out of their chairs and out on the floor with a fully personalized & unique conversation piece! 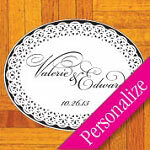 Our wedding floor decals are definitely the one additional item you should add to your reception decorating budget. 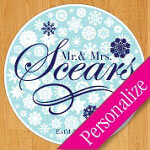 We offer a large selection of removable floor stickers that can be personalized with your names & date — available in an assortment of designs & colors. 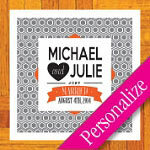 If you can’t find a design that will work with your invitations, programs, etc., our team is happy to create something unique for you. 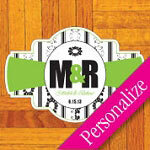 Choose your favorite removable floor decal design from the assortment we have shown above, and then change the colors to match your baby shower colors, wedding theme, bat mitzvah, bar mitzvah, sweet 16 birthday, or other event! 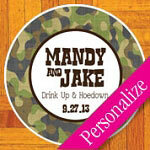 Provide your first names, last name and/or event date and we'll produce the custom-made sticker — in any color combination, just for you. 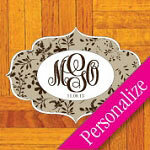 A dance floor monogram decal makes a huge impact in any venue! 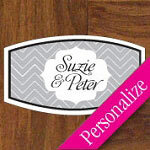 Designed and manufactured for easy application and removal — our professional low tack products are safe to apply to any wood, tile or other non-porous flooring. 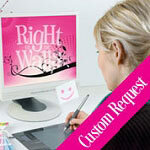 Complete easy application instructions are included with every purchase. 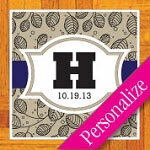 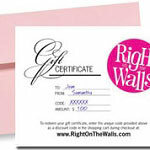 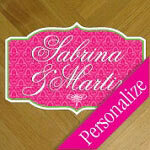 To go along with your floor decal, we can match the design in our wedding wall decals, wedding signs & chair bands.